IT Chimes excels in .NET solutions that helps meet the requirement of businesses irrespective of its niche and scale. 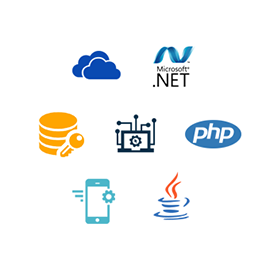 We offer complete .NET development and maintenance services for Web, Mobile and Cloud, tailor made to suit your need. Java has been the bread and butter of the internet industry ever since its inception. IT Chimes has specialists who provide the best Java based web and mobile development services. PHP is a dynamic language capable of delivering a wide range of portal and website solutions. We implement the latest PHP development techniques that derive error free PHP solutions, that are customizable as per your need. Cloud technology is the future of Information Technology. We understand it’s importance and strive to provide top notch Cloud based technology solutions for secured data management systems. It is impossible to run a successful business if you’re not catering to the mobile user base. We have comprehensive mobile app development expertise in iOS, Android, Windows and Xamarin platforms to give you a complete multi-platform experience. Database technology is a trending secured data management technology which uses various languages such as MySQL, SQLite, Oracle etc. to provide real time analytics, big data management and enable you to scale your business quickly. IT Chimes has always been a pioneer in terms of technological versatility. We understand the changing needs of the IT industry and keep ourselves up to date with the new and upcoming technology that we believe will play a crucial role in Web and Mobile development. Our strong R&D department specializes in researching these technologies and ensures that our development teams are trained well enough to deliver the best quality projects time after time.